While Aaron and Daddy were at Grandma's I read the reviews and was a tad worried as it sounded more suited to a 2 rather than a 3 year old. So here is my feedback after day 1. When they came home last night, the saddle was so far extended (they'd built it whilst visiting Grandma after they dropped me home) that it was rocking forward and back but Aaron rode round the flat, on carpet, last night, with it no problem. This morning however, we were outside for mere minutes and the saddle fell off. I knew it needed to go deeper, but was shocked to see an ingraving on it, saying "minimum insertion". This meant that MOST of the saddle neck was IN the frame of the bike. I didn't have a ruler, but what was left, did not leave a lot for adjusting. I wouldn't even call it 10 cm, or just! So for safety's sake I inserted more, and it meant that Aaron was sat lower, with his legs more bent. This saddened me, and reinforced the point that maybe we ought to have got it when he was two. I think it would do a regular 3 year old but Aaron is VERY tall! I reminded myself, as I chatted to my neighbour who was also outside with her 3 year old + bike, that I did buy him a wooden balance bike from Argos a year ago, and refunded it the next day as he could not balance on it AT ALL. What a difference a year makes. Yes his legs may be a little too bent but there was no stopping here. He was off and going on day 1. 1st pic to show you the height and the helmet which I still can't quite master, in terms of getting it secure. 2nd pic, that's my bike and Aaron's - poignant shot the size differential! 3rd pic, I was amazed that he is free-wheeling ALREADY on day 1. 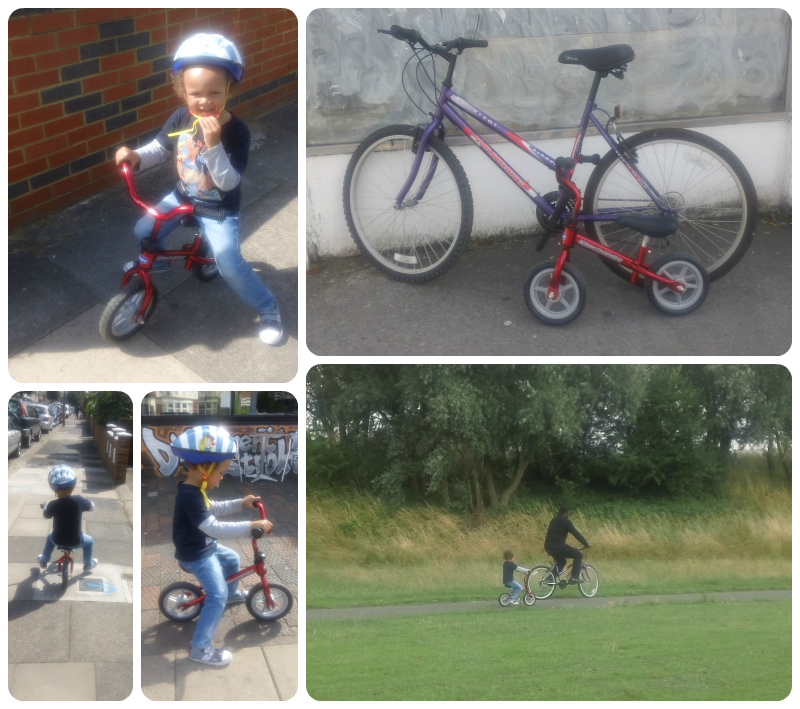 It means it will definitely get him to a proper bike WITHOUT the need for stabilizers. 4th pic I am just including because it is cute! 5th pic, Daddy accompanied us, but at this point he is on MY bike with Aaron. He did not bring his. I am very grateful to Daddy today, as he suggested that we get my bike out of the garage, when I haven't used it in FOUR LONG YEARS... Unsurprisingly, both tyres were flat. He checked the gears, the brakes, oiled the chain, tightened every screw and pumped both tyres. When I got on it, it felt like a new bike rather than something dug out of the garage. Aaron was tickled pink watching me cycle ahead of him. He's only ever seen his Dad on a bike. Everytime I looked over at him he was studying me pedalling, whenever we were alongside each other. It's like he knows a pedal bike will come next and wants to revise and be ready. When he was on his tricycle he never did that. It's like he knows he is going up in the world. Whenever anyone asked why it did not have pedals he said "because it is a balance bike!" (the tone he said it in, had a silent stupid on the end - oooops). A tip if you are getting one. Yes he may have been too young at 2 but don't leave it till 3. Get them to watch You Tube videos of balance bikes. THIS is what made Aaron love it AND is what made him want to wear a helmet. The best videos are the American ones as they call them Striders over there and there's loads of superb videos. Makes me want to get Aaron a taller proper one now, but the 27 pounds this one cost is what our budget can manage at present.